Nissan India recently started selling its cars online following the foot prints of Skoda India Pvt. Ltd.
Customers will be able to book their cars by paying with a credit card. The car will then be delivered to the customer by the nearest Nissan dealership, the company said in a statement. Skoda had started this service in October this year. A customer can book a Skoda vehicle by making an advance payment of Rs5,000. The customer will be fully refunded if he chooses to cancel the booking. Japanese automaker Nissan was late in entering the Indian market and it started selling its products in India from 2010. It has at least 100 dealerships with only six in the national capital region, a Nissan India spokesperson said It sells models including the Micra, Sunny and Terrano. Praveen Sinha, co-founder and managing director of Jabong.com, said if Nissan could crack the markets and customize the delivery options to consumers, it has the potential to fulfil a latent demand, especially in smaller towns. 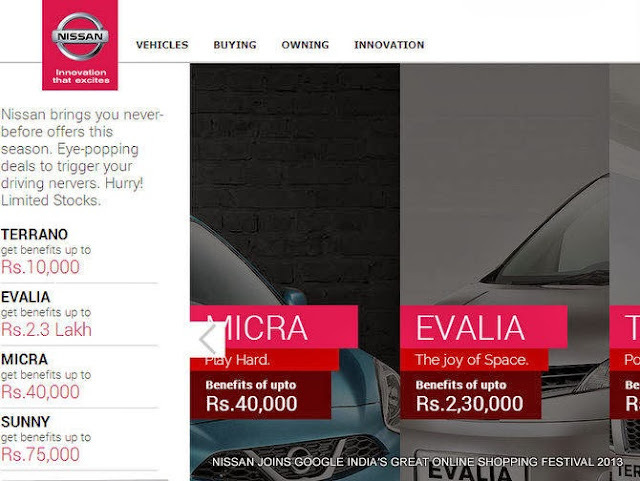 Nissan cars will be retailed online from December 11th to 14th, 2013, as the company participates in the Great Online Shopping Festival (GOSF) 2013. Google has extended this mega event by a day following overwhelming response from shoppers which included over a million users visiting the site in the first 24 hours. You could see discounts of upto Rs 2.3 Lakh on Evalia, upto Rs 75,000 on Sunny, upto Rs 10,000 on Terrano and upto Rs 40,000 on Micra. Nissan buyers will need to visit www.nissan.in/gosf over the period of this Great Online Shopping Festival make their bookings and will be able to make their payments online. These customers will then be contacted by Nissan dealers with details with regard to other formalities and delivery status of their booked models. Mr. Nitish Tipnis, Director, Marketing, Hover Automotive India said, “We are delighted to partner Google India for this exciting Shopping Festival. Nissan’s association with this hugely popular festival is yet another expression of our commitment to market our vehicles uniquely. Partnering with Google helps our associaton with the digital medium to enable brand Nissan and our dealers provide easier and convenient ways to purchase cars in India. This partnership strengthens and widens the customer base to the entire internet audience including smartphone users which is the largest traffic geenerator. ”We want our consumers to experince the globally renowned Nissan cars well known for technology, luxury and comfort –all at an affordable price point and low cost of ownership. Nissan has always been on the forefront of innovation both in the cars we produce and also how we present and communicate our brand,” added Mr Tipnis.